Rush opens in Australian cinemas on 3rd October and is distributed by Hopscotch Films. Now showing in the UK and opening in the USA on 27th September 2013. Rush is absolutely the ultimate film for Formula One fans. It is completely impossible to be a fan of F1 and not have an incredible two hours with this film. This isn't to say that if you are not a fan of this mode of car racing that you will not also enjoy Rush. Ron Howard's latest film is incredibly suspenseful and immaculately made It is also a very good character study of two of the most intriguing figures in motor sport history and an extremely comprehensive retelling of the story of their rivalry. In the early 1970's, two aspiring drivers meet for the first time in Formula Three racing and quickly become rivals, never letting the other out of their sight. Austrian, Niki Lauda (Daniel Bruhl) is extremely serious about his racing and life in general and always plays by the rules. Englishman, James Hunt (Chris Hemsworth) is the complete opposite, as he enjoys the wild lifestyle of drinking and women and the only thing he takes seriously is winning. The 1976 Formula One season was legendary for these two for the fierce battle for the world championship and also for how close one of them came to death during the war. 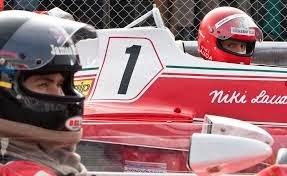 Rush is not purely about the sport of Formula One racing and more about the lives and personalities of Niki Lauda and James Hunt, so it is not to say that if you are not a racing fan you won't enjoy it. Although it does help to have a love of the sport in order to get the most out of this film. The racing jargon and personalities are what F1 fans will be used to hearing and watching and are presented with great care. Rush is absolutely the best car racing movie which has been released in years. The story of these two is an extraordinary one and it is astonishing the lengths they both went to in order to be victorious over the other. The screenplay by Peter Morgan, who has previously teamed up with Ron Howard when he wrote the screenplay for Frost/ Nixon , delves into the characters of Lauda and Hunt so we get to know the two of them in great detail before the film is finished. The only thing one might feel is perhaps even though so much is covered, some important aspects of the character's lives are just skimmed across and not given as much as we would like to see. As the film is for entertainment, there are certain aspects of the rivalry and the character's personalities that are enhanced, but for the large part Rush does remain true to life. Howard's direction is wonderful. The film is very atmospheric as a result of the sounds, visuals and cinematography. The time period of the 1970's is very well recreated and you actually feel like you are right beside the track smelling the burnt rubber of the tyres and in the crowd of people enjoying life in that particular decade. The sound editing is particularly outstanding and the recreation of the racing scenes are superb. There is some really beautiful cinematography involved in these scenes. The slow motion shots of the cars in the rain and the photography around the track is wonderful. The soundtrack for the film is also perfect for the ambitious and competitive atmosphere of the film. Both Chris Hemsworth and Daniel Bruhl do very well in their roles. Bruhl's Lauda is perhaps more interesting to watch as Hunt comes across as rather one dimensional in comparison, and thus Bruhl comes up with a slight edge and gives a better performance than Hemsworth. 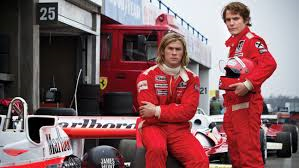 However, in saying this, Rush is quite possibly Hemsworth's best performance to date. Neither character is particularly likable for the large part of the film, but this is where the F1 personalities play a great part. In order to be as successful as these two men were at their chosen sport, there was a degree of selfishness and arrogance they both needed to have to succeed. In this way, Howard has got out of these two actors what is expected of them playing F1 drivers. 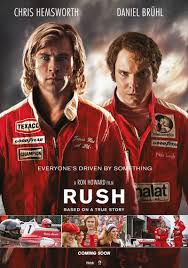 Rush is a wonderful character study of both Niki Lauda and James Hunt. F1 fans will be absolutely thrilled with what they see here and it is a must see for any sport movie fan.